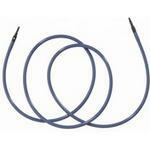 For even more versatility in your Denise Interchangeable Needle Kit, add these 30", 40" and 52" Extension Cords. Now you'll be able to make one very long circular needle cable for the large afghans, blankets, even bedspreads you've been wanting to make. Or you'll use the extension cords for additional long pairs of circulars so that you can be working on several projects at once! Denise Love 2 Knit Sharp Short 3.75 - 6. 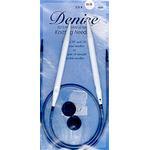 Carry your extra Denise parts plus all the knitting essentials in one perfectly organized fabric case. Two snap-in pages that are sturdy enough to be removed and taken with you for traveling light—to a knitting class, at the dentist, or on the subway. Everything zips shut for secure storage, and is sized just right for all the tools you need to have with you—stitch markers, scissors, measuring tape, whatever you want. 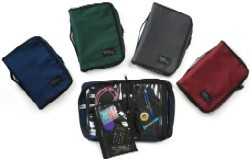 The pockets in the inside covers are divided for easy organization of needles and hooks. All pockets have heavy duty fabric backings and extra-sturdy see-through vinyl fronts so you can always see where your stuff is. They’re big enough to hold a whole Denise kit (plus more), yet small enough to be unobtrusive. 100% made in the USA and designed and built to last a lifetime, the new Organizers are 7.5" x 10.5"
Please email us to see what colours are currenly in stock. Use them alone, or augment your Denise set! 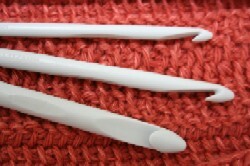 Each pair of needle heads comes with two cords (20" and 24"), for creating circular needles, as well as two end buttons, to allow you to use these needles as straight single points or stitch holders. These are the needles alone (no cord) to add to your Denise set as they don't come with the 7.00mm size, an essential addition.